Climate in Tenerife and weather have almost become clichées internationally, while most know that the south of the island is more arid for getting less rains and clouds. However, the climate in North Tenerife is not the opposite from the South, as it tends to cloud up only in some of its areas, generally. Let me try to explain this better. Clouding up may happen from 4.p.m. onwards, mostly. The locals call it 'Pansa de burro' in Spanish which means that a donkey belly obscures the mountains. Then clouds travel from the ocean to an altitude of 1500 meters where they settle for the night. That means, that lowlands may still be bathed in very pleasant and most romantic sunshine. If there were Tourism Olympics for best climatic and weather conditions for most reliable conditions for sun holidays and healthy living, then Tenerife Island would most probably get the gold medal if there wasn't winter. Then, rain could occur during some days from November until April and snow by Mount Teide. Just look at the millions of winter hibernating tourists that keep on coming with cheap airlines to Tenerife every November to stay more than five month, so often. Snow fun or hot summer sun? Everybody that's been to Tenerife in winter knows that both can be enjoyed in one day. However then, snow chains are more than optional for driving into the mountains. Always get radio traffic reports in winter to find out if the TF24 from La Laguna to Teide isn't partially closed because of snow and ice. The same may happen also to the TF 21 the Teide access from La Orotava. The BBC also has a forecast for the North Airport of Tenerife. However, you don't want that for the region from El Sauzal right up to Los Silos, hence the north and the island's Westcoast, as Los Rodeos airport really is the odd one out as far as weather is concerned. And again, it's also not good enough for the Capital Santa Cruz which is almost in an extreme north East location and can be hot but, also windy. In fact, on-line weather tools are not always making me happy because, I often find different temperatures when going out onto my balcony 1o minutes from Puerto de la Cruz in Tenerife North. Read more about why Tenerife weather by Puerto de la Cruz in my area cannot be the same as shown in Internet graphics for north Tenerife. Tenerife winter is rainy season and not Monsoon time but, November until April inclusive can bring rains which are very often recurring showers. The general differences between 17 degrees Celsius and 30 degrees Celsius over the year are very acceptable while general temperature fluctuations are usually insignificant, as 24 degrees Celsius are almost the norm. Tenerife weather 2007/2008 almost showed a record without rains, until relieve came by early downfall end of October/beginning of November. Dry and yellow looking country sides in Tenerife North including palms by the famous Lido/Lago Martianez quickly recovered their lush green. The south of the island was expected to also benefit by this change of climate. Nevertheless, I spotted Tenerife north swimmers in the Puerto Cruz ocean which still had 22-23 degrees Celsius in this first of European winter months with plenty sun time left. April Tenerife spring weather at La Longuera by Puerto de la Cruz, for instance, has lots of charms. Its sea side and mountain climate are just as enchanting. Relative humidity is often around 70 %. Nevertheless, cars by Tenerife coasts don't seem to rust like they did when I lived in Durban South Africa by the Indian Ocean where humidity in summer often was about 80 and 85%. So why is the climate in Tenerife with its relative high humidity so much more pleasant? and the trade winds all around it. Tenerife climate contrasts depicted by a palm avenue near Icod de los Vinos with a snow capped Teide behind. You will notice enormous Tenerife climate contrasts above all from November to April. 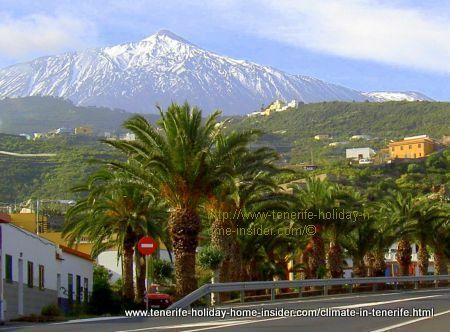 Imagine Mount Teide covered in snow then, while bananas, oranges and lemons grow on the island's orchards. Needless to say is that northern tourists swim in winter with 18 or 19 degrees Celsius in the Atlantic. The sea water temperature reaches about 24 degrees Celsius by July/August. Needless to say is that climate in the Teide National Park is unique. Its weather station has been at Izaña since 1916. The astro physics installations in the same location have been improved slowly since 1964. Its Mount Teide observatory was built thanks to the fortunate climate in Tenerife which provides very clear highland skies. Therefor, any new telescope is a good investment. By the way, you may rely on the superb Izaña Webcam to see its actual and instant atmospheric conditions with sun, clouds, rain, wind or snow. Oxidation of thin untreated metal due to the climate in Tenerife is quite strong and, everything like metal door hinges inside and outside should be brushed with rust protection, varnish or paint, at least every 2 years. That's the recommended number given by paint companies. Wood outside on a balcony, for instance, is of course vulnerable and requires oiling with teak or linseed oil and or varnishing or painting in Tenerife due to its island climate. 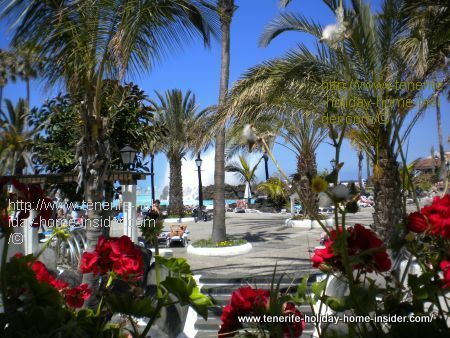 A holiday home in Tenerife needs almost as much care as a home everywhere else. The only difference being is that you can look after your property, almost all year round, because, the weather on the biggest Canary Island opposite Morocco permits working outside, almost, all year round. 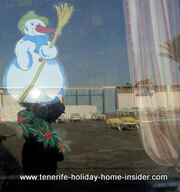 And, don't worry about 'real' snow and hurricane damage in the Canary Island region where Tenerife belongs to. Photo by Jaysanico with copy right which needs permission to copy it. 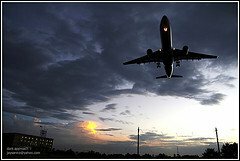 Thanks to Spain very sophisticated weather forecast methods used for aviation and cheap flights Tenerife, virtually, no more danger for airport crashes caused by bad weather exist, nowadays. We had a bit of a hot 2008 August temperature spell of around 30 Celsius by Puerto de la Cruz. 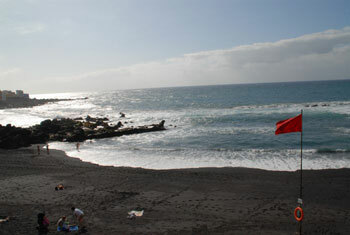 Tenerife winds often bring up the red beach flag which can change quickly. Those breeze winds are also responsible for the lovely climate in Tenerife for surfing surfing. being able to make a big thing out of it. There were storms on the island I wasn't even aware of and slept right through the night. Protect your holiday home against storm! However, never leave your holiday home unattended with stuff on balconies, on verandas and in gardens. Things moved by Tornado like forces during unusual climatic conditions in Tenerife can in some cases cause havoc and damage other property or people. Move things into shelters and see that everything is well secured. Learn how the climate in Tenerife also depends on global warming, which may bring gale force winds, such as Cyclone Xynthia of 2010 which did much damage in France but was only called a Deltita by Tenerife locals, disdainfully. 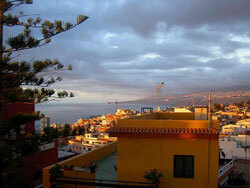 However, one fact is for sure in regard to climate in Tenerife. There may be more clouds in the north but they don't bring such gale force winds as in the south. Generally, there is even too little wind in the Orotava Valley. Windmills could never operate there. Friends pointed this out to me and they are absolutely right. Most of the time when we had blown over electricity masts and other big storm damage, than that was in Southern Tenerife with very few exceptions by Puerto de la Cruz over the last years. Arona had hail and snow early in the year 2014. There were no such climatic extremes in the north. Unusual landscape photos with snow on Mount Teide, while tourists swim in the sea. Ocean currents which work together with Elysian winds and contribute enormously to the fortunate climate of this whole region called Macaronesia. The foggiest Tenerife region and the biggest aviation disaster. The Climate in Tenerife is fantastic, most stable and truly the world's best for the elderly my mind. However, the young may not want to miss a cold day with ice skating.